Hotcore Outdoor Products has a Discovery line of tents which offer 3, 4 or 6-person options for your next family adventure. These tents are quite affordable and made from tougher materials to stand up to whatever the family throws at it. The vestibule and door opens up nice and wide for bringing gear in and out of the tent. We tested the Discovery 3 family tent that offers a spacious 210 cm by 210 cm (7’ x 7’) floor that will easily fit three sleeping bags across with room at your feet to stow gear. Even if you think you are running out of room in the tent, you will be pleasantly surprised by the vestibule which offers a generous amount of space itself. The entire tent comes in a surprisingly small carrying case. The entire line of Discovery Tents utilize a durable 210D polyester floor which stood up to our wear and tear (including a 22kg dog) with no troubles. The floor is also coated with a 2000mm PU waterproof coating that wraps up around the base providing you protection from pooling water even if it rains quite heavily during your trip. Thankfully with all the space inside (the tent has 130 cm of height) your family won’t feel claustrophobic during a storm. Set-up of the Discovery is easy. It can be done with one person, but it's far easier with two people. The instructions are printed on a rip-resistent material sewn into the bag so you will never loose them. Simply extend the three 8.5 mm fiberglass poles and you will find two of them are longer. These thread through the pole sleeves and create the frame of your tent. Remember to push the poles through (for both assembling and disassembling your tent), not pull them through or else it just makes the process fiddly as they come apart. The last pole is for your vestibule. After clipping your tent to the poles and staking down the corners you have a home for the night. During a relentless wind storm I was pleased at how well the frame didn't budge throughout the entire night. 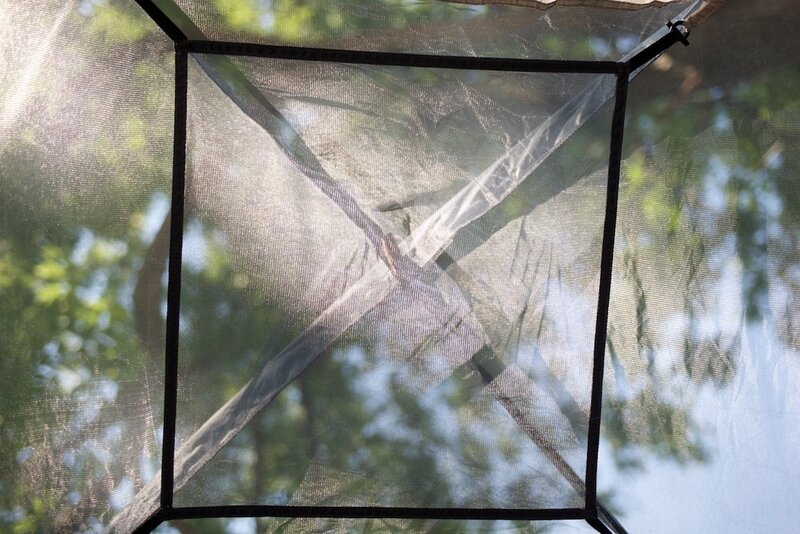 The tent fly is also constructed from 70D Polyester fabric (and also has a 2000mm waterproof coating with taped seams) which stands up to harmful UV rays and should last for years to come. I like how the zippers and loops to tie up the vestibule door (including the main door) are oversized and even children would be able to use them without any trouble. There is only one door on this tent however, so it might be best to line up the sleeping bags with it so people leaving for a midnight bathroom break aren't crawling over anyone else. A gear loft was a nice surprise and comes with the tent! There is a row of three pockets along the one wall which are quite large! The Hotcore Outdoor Products Discovery 3, 4 or 6-person tent should be on your shopping list if you're looking for a tent to take the family out on their next camping trip. It is very spacious, made from very tough material, all while only taking up a small amount of room in your backpack. Hotcore Products is 100% Canadian owned and operated company and you can find a store near you that carries them by using their Where to buy map. Stay connected with them by following them on Twitter. Full disclosure: At the time of review, Hotcore Sleeping bags supports Traversing by purchasing banner ads. We try to remain impartial while writing this review and hope to bring you an unbiased look at this piece of gear.